Home » Economy » How High Is the True U.S. Unemployment Rate? How High Is the True U.S. Unemployment Rate? The unemployment rate is back to early 2008 levels. Does that mean the economy has recovered? In the most recent U.S. jobs report, released at the end of last month, the unemployment rate remained stable at 5.1%. Taking this number at face value, U.S. employment has returned to pre-crisis levels, and it would seem the economy is back to normal. Still, for all the times I have read that we should not blindly trust the unemployment rate, I don’t recall ever seeing a clear explanation of exactly what groups are omitted from the calculation. It turns out there are many. Along with the official unemployment rate, the government produces 5 other measures of employment, called alternative measures of labor underutilization. They range from U-1, a strict definition of what constitutes “unemployed,” to U-6, the broadest definition. 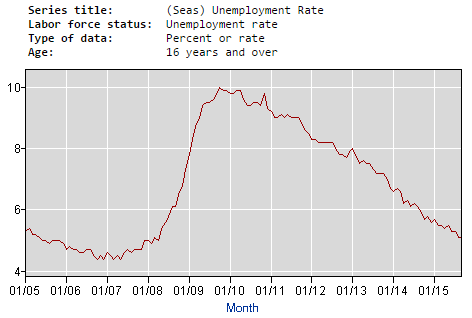 The official unemployment rate, U-3, is somewhere in the middle. U-1 measures only people unemployed 15 weeks or longer. U-2 consists of job losers and persons who completed temporary jobs. U-3 is the official unemployment rate, including all people who have actively been looking for work in the last 4 weeks. U-4 includes the unemployed, as defined by U-3, plus discouraged workers, people who want to work, but have given up searching because they were not able to find a job. U-5 measures the same groups as U-4, plus marginally attached workers, people who are available and want to work, but are not currently searching for a job for a reason other than discouragement over job prospects (e.g. transportation problems, ill health, family responsibilities). U-6 is the broadest measure, including everyone included in U-5 plus people who are working part-time because they are unable to find full-time employment. I had always understood discouraged workers to be the most important piece missing from the official unemployment rate. But looking at these figures, it appears that adding discouraged workers makes only a small difference to the overall unemployment figure. The same is true for marginally attached workers. Part-time workers unable to find a full-time job are the only group that raises the number by a substantial amount. And while I fully appreciate the importance of measuring this group, it’s pretty logical that underemployed workers would not be included in the unemployment rate. So it seems like a stretch to call the unemployment rate wrong for this reason alone. The alternative unemployment measures listed above contemplate two groups of people who want a job, yet are not technically considered “unemployed” (discouraged workers and marginally attached workers). However, there is a third group that is left out from these measures: people who want a job, but did not search in the previous year. This group is not only the largest of the three, but it has also continued growing steadily since 2007, whereas the other two groups initially grew, but have since recovered. Marginally attached workers and discouraged workers are not counted in the official unemployment rate, but they are included in the government’s alternative unemployment measures. Like the unemployment rate, their trends are consistent with a recovering job market. The third group, people who want a job, but have not searched for one in the past year, is not included in any of the alternative unemployment measures. It’s trend is strictly upward, and does not conform to the economic recovery narrative. 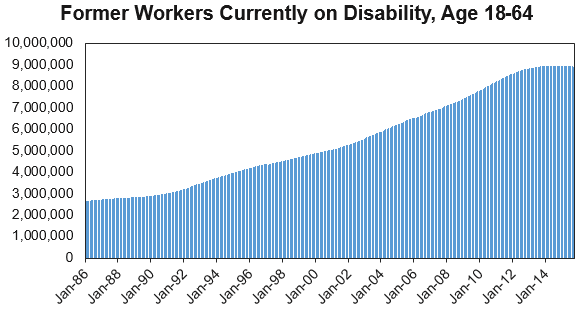 Another group that is not commonly discussed in the context of the employment picture is the skyrocketing number of people on federal disability. 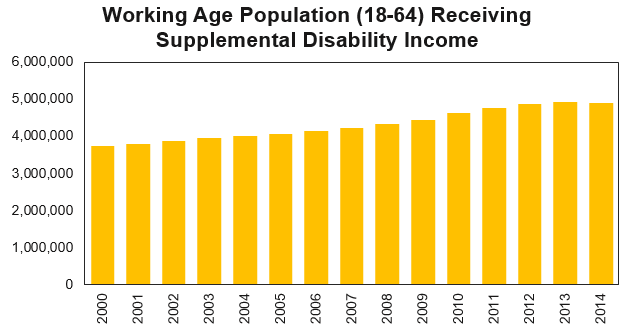 Here is how the two largest disability programs, Social Security Disability Insurance (SSDI) and Supplemental Security Income (SSI), have grown over time. Before you call me out for picking on people with disabilities, please have a look at this excellent post from NPR’s Planet Money, which goes into depth on the topic. The story is fascinating. Somehow, federal disability programs have remained under the radar, despite having grown immense in size. Not to minimize their importance for people who have legitimate disabilities, but for many people who do not, these programs have essentially replaced welfare as an alternative source of income for people who are discouraged / hopeless about their employment prospects. These disability programs have also continued to grow throughout the economic downturn and recovery. With a few small exceptions, beneficiaries of these programs are not counted in the official unemployment rate or any of the government’s alternative unemployment measures. How does the picture look when you put these pieces together? These charts plot each of the groups mentioned above, from 2007 to 2014. To what degree is arguable, but groups (a), (b), and (c) all include working-age people who are not currently employed, but would like to work if circumstances permitted. If you were to include these groups in the unemployed population, the total number becomes essentially flat since 2009. Is this a more accurate picture of U.S. employment? What do you think? Is the unemployment rate just a big lie? Or is it the best measure of unemployment we have, despite it’s flaws? If you don’t mind, I think it would be great to see a sum of U-4 and your (a)+(b)+(c) curve. As I understand it from the article, they should be nonoverlapping populations. Good suggestion, thanks. Updated w/ U-3 + a + b + c (U-4 would double count the discouraged workers). Thanks! So unemployment is slightly lower in 2015 than it was in 2010 (even after including disability), but the total number of people who could be employed but aren’t has substantially increased from 2007. Planet Money makes the point that the number of newly Disabled closely well with the current unemployment rate, but I wonder if it correlates more closely with the number of people freshly Discouraged. There are some years where unemployment seems to be they appear to be different than discouraged (like 2010), and this comparison would answer the question whether people are using Disability like a welfare substitute for people who don’t want jobs and have some degree of medical disability. Agree with your logic. And without running the numbers, it looks like you’re probably right. 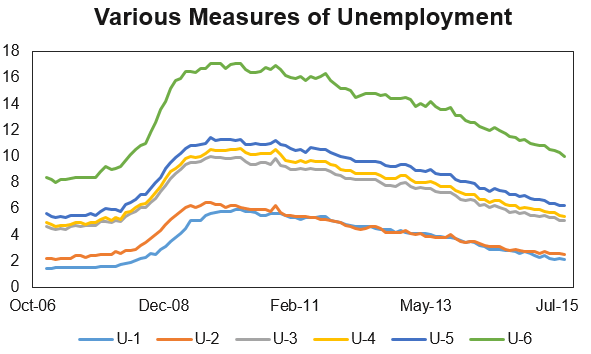 U-4 and U-5 lag the unemployment rate. And based on the Planet Money chart, so do disability applications. Since this article starts out stating it’s using data that’s “most recent” and “last month” it would be nice to have a date reference in the first paragraph. You’re right. I really should get the post dates on here. This one was from the last October. This is great work. What would seem important to include is the changes in income that has taken place within the entire population. From what I have read, the middle class is significantly shrinking. A lot of this rise in employment is with individuals who have moved from higher to lower paying jobs and often way below their former pay grade.